$2099$20 and 99 cents$65.59 / oz. 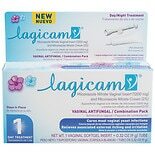 Shop Lagicam Antifungal Miconazole Nitrate 3 Day Vaginal Cream (.9 oz. ).9 oz. Shop Lagicam Feminine Wash Fresh, Fresh Scent (15 oz. )15 oz. $699$6 and 99 cents$0.47 / oz.